These heated jacket bundles offer the ultimate in flexibility and value. Use the heated jacket or the heated gloves at the same time from the same battery OR use them separately i.e. either just the heated jacket alone or just the heated gloves without wearing the jacket. 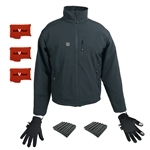 Bundle offer: 6-layer water-resistant insulated soft shell jacket and heated glove liners keep you warmer and drier. Includes Two (2) RECHARGEABLE lithium battery packs & Two (2) 6 x AA battery cases. 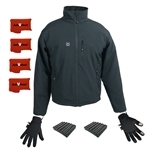 Bundle offer: 6-layer water-resistant insulated soft shell jacket and heated insulated gloves keeps you warmer and drier. Includes Two (2) RECHARGEABLE standard lithium battery packs & Two (2) 6 x AA battery cases. SMALL size only. A six-layer, water resistant TurboHeat Jacket provides 78% more heat when in TurboHeat Mode + Weightless Glove Liners give you the warmth you need and the convenience you want. Power both garments off ONE (1) compatible Battery Pack with our new Power Cable Splitter Adapter. Includes TWO (2) ActiVHeat Standard Capacity RECHARGEABLE Battery Packs, ONE (1) Power Cable Splitter Adapter, ONE (1) Dual Charger & TWO (2) AA battery cases. A six-layer, water resistant TurboHeat Jacket provides 78% more heat when in TurboHeat Mode + Weightless Glove Liners give you the warmth you need and the convenience you want. Power both garments off ONE (1) compatible Battery Pack with our new Power Cable Splitter Adapter. Includes THREE (3) ActiVHeat Standard Capacity RECHARGEABLE Battery Packs, ONE (1) Power Cable Splitter Adapter, ONE (1) Dual Charger, ONE (1) Standard Charger & TWO (2) AA battery cases. A six-layer, water resistant TurboHeat Jacket provides 78% more heat when in TurboHeat Mode + Weightless Glove Liners give you the warmth you need and the convenience you want. Power both garments off ONE (1) compatible Battery Pack with our new Power Cable Splitter Adapter. Includes FOUR (4) ActiVHeat Standard Capacity RECHARGEABLE Battery Packs, ONE (1) Power Cable Splitter Adapter, TWO (2) Dual Chargers & TWO (2) AA battery cases.